"BUILDING UP THE ATLANTIC WALL"
DECEMBER being the ‘Festive Month’ here at King & Country we have brought together a select little collection of interesting and historical subjects that provide the perfect Yuletide gifts for collectors and history buffs alike. So, sit yourself down, put your feet up and take a closer look at what might be under your Christmas tree on the 25th of December. 1. "BUILDING UP THE ATLANTIC WALL"
The Atlantic Wall was an extensive line of coastal defences and fortifications built by the Germans between 1942 and 1944 along the coast of Western Europe and Scandinavia. Its purpose was to defend Nazi-occupied Europe from an attack expected to come from Great Britain. Although construction began in 1942 by late 1943 it was far from complete and its actual strength and size was greatly exaggerated by German propaganda. Early in 1944. as an Allied invasion of the Continent became ever more likely, Field Marshal Erwin Rommel was put in charge of improving and building up the wall’s defences. Rommel’s main concern however was Allied air power. He had seen in North Africa how the might of the British and American air forces could inflict huge damage on his ground forces and it had left a deep impression. In Western Europe he also knew that any German counter attacks would be broken up by Allied aircraft long before they reached any invading beachhead Rommel intended to stop the enemy invaders on the beach itself and to accomplish that many more bunkers, pill boxes and beach obstacles had to be constructed and installed as quickly as possible. In order to do that plans, designs and models for all of these defences had to be approved by the Fuhrer himself. WH093 "Hitler, His Generals & The Atlantic Wall"
This original display set portrays just one of the many meetings where Hitler, the amateur architect, and three of his top generals, including Rommel review some of the latest design models for additional Atlantic Wall fortifications. The set includes an arms-folded Fuhrer, Field Marshal Rommel, Field Marshal Walter Model on leave from the Eastern Front and SS Oberst-Gruppenfuhrer ‘Sepp’ Dietrich who would go on to command the 1st SS Panzer Corps during the Battle of Normandy following the invasion. In front of all four figures is a large table on which are displayed a number of different bunker and pill-box design models for Hitler to comment on and, hopefully, approve. A great little set that helps tells part of a very big and dramatic story! Go back almost 1900 years and you find yourself battling a different set of invaders… The Romans this time! RnB024 ""A Head for a Head!" #1"
A Celtic warrior triumphantly holds aloft a severed Roman head! RnB025 ""A Head for a Head!" #2"
A Roman soldier returns the compliment. RnB026 "Optio w/ Sword & Helmet "
A useful figure to have in any camp or fort scene... This ‘Optio’ observes what is going on around him. RnB028 "Boadicea, Queen of the Iceni"
Boadicea or Boudica if you prefer was a Queen of the British Celtic Iceni tribe who led a major uprising against Roman rule in AD60-61. Originally Boadicea was the wife of Prasutagus, King of the British Celtic tribe called the Iceni. He ruled as a nominally independent ally of Rome but when he died Rome annexed his kingdom and had his property confiscated. Prasutagus’ widow, Boadicea was a strong and skillful leader herself and soon gathered together her own and other tribes angry and rebellious against Roman rule and determined to overthrow it. Within a short time Boadicea and her armies conquered and sacked several of the most important Roman settlements in Britain... They destroyed Camulodunum (Colchester) and even Londinium (present day London). An estimated 70-80,000 Romans and their British allies were killed during this brief but bloody reign of terror. Soon however the Romans regrouped their forces and, despite being heavily outnumbered, defeated Boadicea at the Battle of Watling Street (an ancient trackway between St. Albans and Canterbury). Following her defeat she is said to have taken poison to avoid falling alive into Roman hands. Our first Boadicea has the Queen standing ready to meet the Romans. Here the Queen adopts a more aggressive stance... both hands clutching her dead husband’s sword. Woe betide any Roman that comes near to this Warrior Queen! Here are the first 5 reinforcements for the hard-pressed little garrison defending the old Spanish Mission in San Antonio against the might of Santa Anna’s army during March 1836. Concerning the actual number of men defending the Alamo most eye witness accounts vary… anywhere from 182-257. Everyone agrees though that they came from all over the then United States and Europe as well as some locally born Tejanos (Texans of Mexican descent). RTA109 "Joseph Kerr, New Orleans Greys"
This Louisiana man was one of just 23 men from this volunteer militia unit that fought and died at the Alamo on that fateful morning of March 6, 1836. He still wears his grey tunic although has adopted a more practical broad-brimmed straw hat. Here he moves forward while reaching for a fresh cartridge for his musket. RTA112 "William Lightfoot of Kentucky"
A recent migrant to Texas, he came to seek his fortune and adventure... At the Alamo he will find neither but well-armed with his rifle, a pistol and a knife he will go down fighting and into history. RTA113 "John Purdy Reynolds of Pennsylvania"
Another of the Easterners who sought their future in Texas. Here he advances on the Mexican infantry storming over the wall in early dawn of March 6. RTA114 "William E. Summers, Gonzalez Mounted Ranger Company"
In the early hours of March 1, 1836 a small, mounted force of 32 men picked their way carefully through the Mexican lines and then made a mad, wild dash for the main gate of the little beleaguered mission. All of them knew their chances of survival were slim but they remained with their fellow defenders and fought to the bitter end in the final battle. William E. Summers came from Tennessee and had originally been a trapper and still wore his buckskin jacket. RTA115 "William P.King, Gonzalez Mounted Ranger Company"
The youngest volunteer in the Ranger Company and also one of the youngest in the entire Alamo Garrison... just 16 years old. His father was to have been part of the Gonzalez Company but took sick... Young William replaced him and even at 16 was a skilled horseman and crack shot. 4. "CONTINUING WITH THE KUBELWAGENS..."
WH088 "The Feldgrau Kubelwagen Ambulance"
This ‘feldgrau’ field grey Kubelwagen is typical of the early-war period from 1939-1942 when virtually ALL German Wehrmacht vehicles were painted a standard field grey. This particular Kubelwagen stands ‘empty’ awaiting both its driver and wounded passenger. 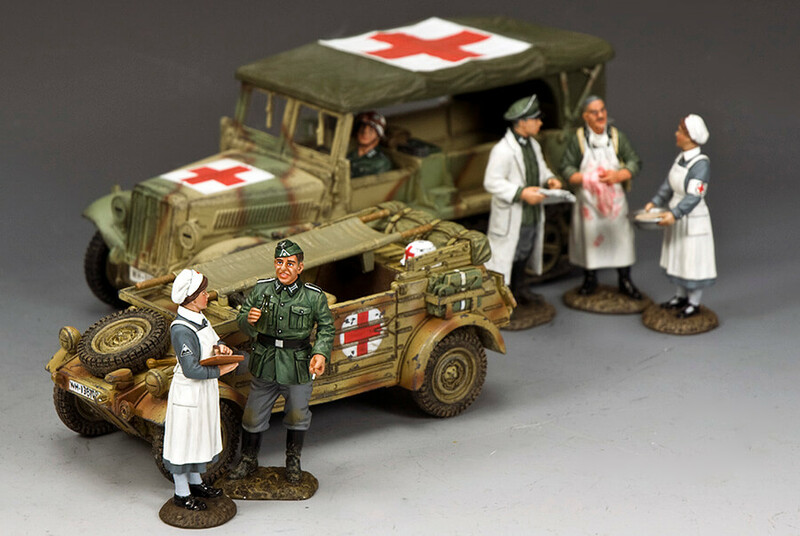 Ideal for any display using our other German battlefield ambulances and medical personnel. WH094 "The "Afrika Korps" Kubelwagen Ambulance"
Another version... another ‘Theatre of War’... North Africa this time and painted in ‘dunkelgelb’ (sand yellow) and rust / brown camouflage. Perfect for desert dioramas between 1941 and 1943... or even Sicily and the early Italian Campaign. The successful and daring rescue of deposed Italian dictator Benito Mussolini from the top of the Gran Sasso plateau must go down as one of the most dramatic special forces operations in military history. Arrested by his own senior officers in July 1943, the former ‘Il Duce’ had been imprisoned in an isolated and well-guarded mountain-top resort in the heart of Italy called Hotel Campo Imperator. Access to this Hotel could only be by a heavily-guarded cable-car station… or so the Italian captors thought. An infuriated Adolf Hitler demanded that his old friend and ally be rescued and gave the task to his Paratroop Commander, General der Fallschirmjager Kurt Student to organize. This, Student did immediately and brilliantly selecting some of his best paratroopers and officers. For political reasons, an SS detachment, under the command of Haupsturmfuhrer Otto Skorzeny had to be involved, much to the dismay of both Student and his men. On 12 September 1943, Student’s Fallschirmjagers plus Skorzeny and his small group of Waffen SS mounted their daring glider-borne assault on the Hotel and its most famous imprisoned occupant…. This great-looking four-man set portrays a forlorn-looking Mussolini just a few minutes after his rescue walking with his hands dug deep into the pockets of his long, black overcoat... On his head a black ‘Fedora’ hat pulled well down a far cry from the proud and strutting, uniformed leader of just a few years before. By the dictator’s side is the tall, confident figure of Hauptsturmfuhrer Otto Skorzeny, Himmler’s chosen man to accompany the Luftwaffe Fallschirmjagers on this dangerous mission. Skorzeny, although a Waffen SS officer, is wearing the tropical uniform of a Paratroop Officer. The reason for this is that it was felt that German Luftwaffe airmen would be more ‘acceptable’ to Mussolini’s captors than SS men...! Flanking both men are TWO actual Fallschirmjagers... One officer and one enlisted man... It’s interesting to note that while the officer carries the well-known Schmeisser MP40 machine pistol, his junior carries the revolutionary FG-42 Assault Rifle. This weapon, built in small numbers, was very advanced for its time but too costly and utilized too many precious metals to be manufactured in great quantities. Both of our Fallschirmjagers are wearing the ‘Tropical’ versions of their camouflage smocks and the light Khaki, loose-fitting trousers. This set also comes in its own Labeled box. Last July, K&C launched the first 5 “Aussies in Vietnam” figures… One set of 4 making up part of a fighting patrol plus a single patrol commander figure to celebrate 10 years of our Annual Visits Down Under to meet our dealers and talk to our collectors in that part of the world. I am happy to report that these new ‘fighting Aussies’ proved a big hit not only in Australia but around the world with other K&C collectors… Especially those who were already collecting our ‘Vietnam Marines’! This latest 4-man set comprises four terrific add-on figures to the first five. Leading the way is a kneeling Aboriginal soldier of ‘The Royal Australian Regiment’ holding his M16 in one hand and signalling silently to his mates that the ‘enemy is in sight’. Another kneeling soldier nearby lifts his L1A1 SLR to his shoulder and prepares to engage the enemy. Meanwhile the remaining two soldiers move stealthily forward to take up fire positions as they await the remainder of the 9-man patrol to follow up. If you are collecting K&C’s ‘THE REAL WEST’ you can never have ‘too many Indians’!!! Especially one as fine as this mounted warrior. A Cheyenne ‘Dog Soldier’ ready to take on Custer’s 7th Cavalry or maybe just acting as a scout for a marauding War Party. However you choose to use him he makes a fine addition to any Plains Indian collection. 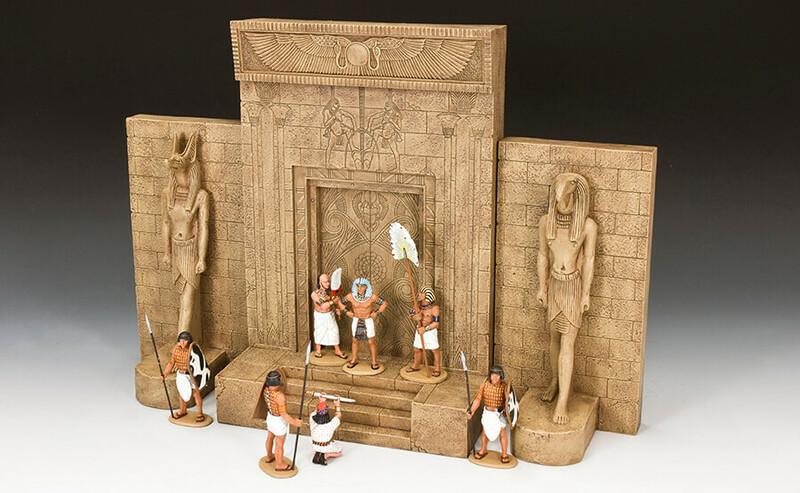 AE053 "The New Pharaoh's Gate"
A handsome Ancient Egyptian background piece that can be added to or stand-alone – works equally well. In 2 x pieces…the base and stone steps and the decorated wall and gate. AE054 "The Wall Gods Set"
Two statues, mounted on wall sections, portray “Annubis” and “Thoth”, two of Ancient Egypt’s most revered deities. Goes well with the previous AE053 “New Pharaoh’s Gate”. This is the third and final version of this popular German tank... and it's in "Dunkelgelb" which is German for "Dark Yellow". Panzer IV's and their variants saw plenty of active service in Russia, North Africa, Sicily, Italy and all over Europe. This particular vehicle has an Afrika Korps veteran in the turret. The "H" variant first appeared in 1943 and saw most service in that year and the following one. Following Rommel's defeat in North Africa in May 1943 most of the Afrika Korps were captured some however did manage to eacape Sicily and Italy and live to fight another day... Our tank commander was one of them! The second version sports a “Wine Red” finish and again has a driver on the back seat. And that my friends is that for December and 2018. By the time you read this I will have taken part in the Yuletide ‘London Show’ and be on my way to Paris for a ‘Collector Event’ there followed by another ‘Meet ‘n Greet’ in Italy a few days later. Before I know it I’ll be back in HK and hard at work preparing for 2019. So, may I take this opportunity to wish you all, near and far, a very Merry Christmas and a happy, healthy and prosperous New Year!